In the Town of Yellow Spring in Hampshire County, there’s a machine gun range that is shooting machine guns across the Cacapon River, located off of Route 259 just above the Hampshire-Hardy County line. 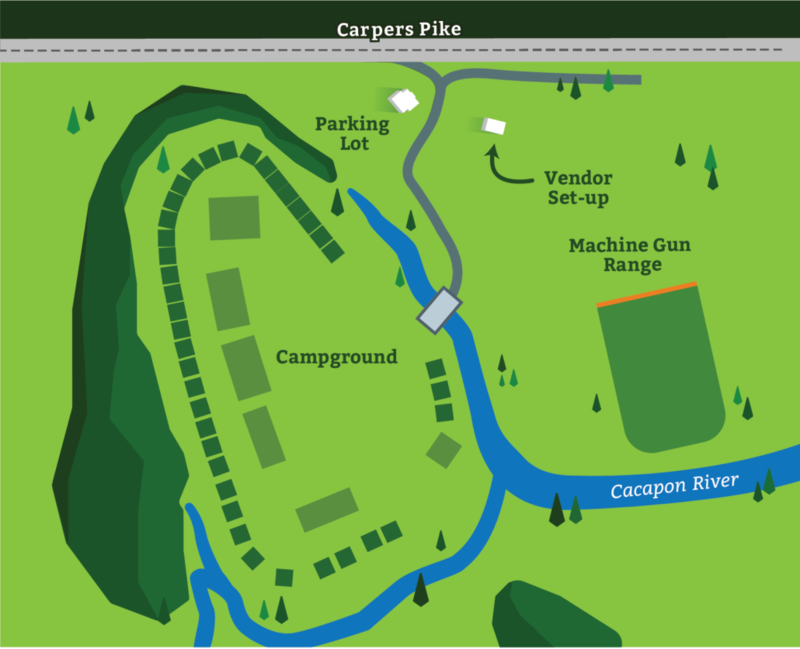 The range is called Lost River Shoot, and it has set up a large-scale machine-gun range on a 900 acre parcel of land on the Cacapon River—with nothing to stop the bullets from hitting trees along the riverbank and passing across the river to the other side. We believe paddling on the Cacapon River in Yellow Spring near or passing this gun range is dangerous. The range is located on the Cacapon River between the CAPON LAKE and the YELLOW SPRING public river access points. Please avoid this float trip—or use extreme caution at the very least. The Cacapon Institute and the Friends of the Cacapon River are working together to determine a way to stop the shooting and to keep our members and paddlers informed and safe. We both strongly oppose anything that jeopardizes the public’s access to The Cacapon River Water Trail or the river’s excellent reputation as a paddle destination. We have discussed the situation with the West Virginia Department of Natural Resources (WVDNR), the West Virginia State Police, local politicians, and floodplain managers, among others. They are equally against the current shooting practices of Lost River Shoot—but unfortunately no law is being broken. This fact was confirmed by the state’s prosecutor’s office during a discussion with a WV state police sergeant and by a lieutenant from WVDNR. We are now trying to determine if Lost River Shoot acquired all the appropriate DEP, EPA, and FEMA permitting before construction and for their specific shooting practices. We’re also exploring other options including public petitions and legal amendments. While we are working to stop this reckless behavior, please use caution and stay safe when paddling on the Cacapon River in Yellow Springs.